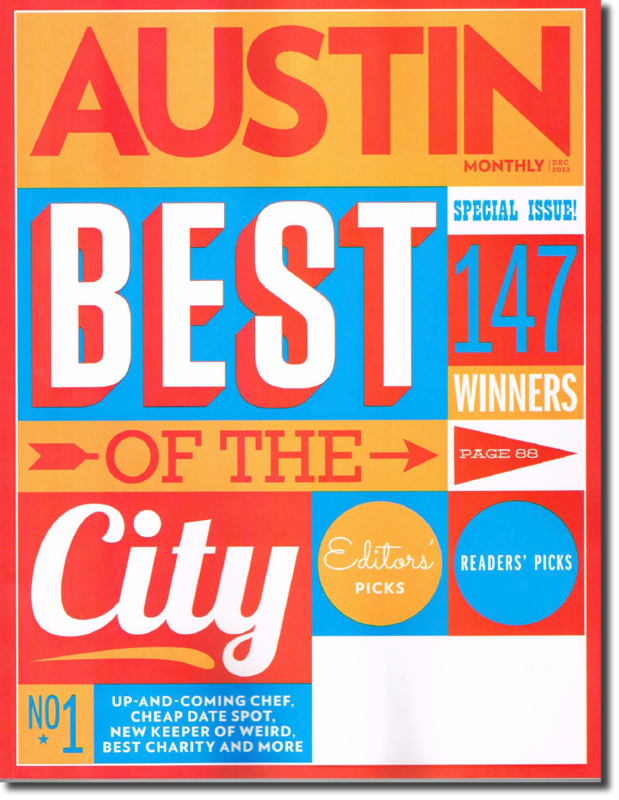 WE'VE WON BEST PARTY BAND AND WEDDING BAND FROM AUSTIN MONTHLY, WEDDINGWIRE AND THE KNOT... BUT WHAT REALLY COUNTS ARE ACCOLADES FROM OUR CLIENTS. Wow! What an incredible party and performance. People keep asking me "Who was the band?" "Where are they from?" Best wedding band I've ever heard!" I guess the best compliment is when the bride tells you "Daddy, I don't want this to end. "Thanks to all of you for making such a memorable evening for all of us. "We can't quite express how unbelievably perfect our wedding was. You guys KILLED IT and we are so thankful for the countless hours you put into your craft. We have heard many times since Saturday that y'all were the greatest wedding band our guests had seen. We so truly appreciate everything you did for us - coordinated the ceremony music, played a perfect dinner set, MC'd the whole night, learned our first dance song, and put on THE BEST dance party ever. The videos our guests have are amazing so we will make sure to send them your way. Eric and I are still on top of the world and we want to thank you so much for being a part of our day. It wouldn't have been the same without the Matchmaker Band!!" "This band is worth every penny and more!! They were seriously the highlight of our wedding!! Everyone could not stop talking about them. My grandma even stayed up until midnight and couldn't wait to hug them after! They rock the house and have so much energy. You would think doing this every weekend they would get a little worn out but they came in guns blazing and put on an amazing show. I feel so lucky to have had them!! Their trumpet player is amazing as well! He did our ceremony music which was modern songs played on a solo trumpet and he killed it. Cannot recoMmend these guys enough!!" "I'll hit 500 hundred weddings at the end of this year and rarely does a wedding have me smiling from ear to ear the way I was last weekend. I actually took a picture of the empty chairs (and tweeted it!) because literally everyone was on the dance floor. The mother of the bride said the second line send-off was "epic"! You make the planning portion easy and fun! You're always so attentive to the details and WANT to get it all right. You made one couple incredibly happy. And one happy planner, too!" "Matchmaker played at my daughter's wedding this weekend and the music was definitely a highlight! The bride and groom love Motown music but also country and pop and there was a perfect blend of new (Uptown Funk) and old (Shout and At Last). We continue to get emails and calls about how amazing they were and comments include "Best Wedding Ever!" and "I want to wedding crash every wedding they play at!" I'm just sad that I only have one daughter to marry because I would definitely book them again. Very entertaining, got the crowd involved. Plan early because they book up fast! You will not be disappointed!!!" "What can I say? The band made the night! From the moment y'all began playing until the last song people were on the dance floor. Thank you for making my daughter's night spectacular. You were so easy to work with - very responsive, that is so important in your business! Thank you and your entire band and crew for an amazing evening!" "That undoubtedly was one of the finest performances I have had from a band at one of my weddings. You all were great, you were terrific!" "My wife Anna and I just had the honor and privilege of getting married yesterday and I can think of no better way to celebrate than with Matchmaker Band. Their musicianship was flawless and their stage performance was incredibly and contagiously energetic. It was clearly evident that each and every member of the band has a passion for the music they love and that comes across with every song they play. If you're reading this and are curious about having them play for you, do it. Book them for all of the things forever because this incredibly talented group of people will make your day a million times better. From the bottom of our hearts thank you so very much." "My wedding was 11 days ago and I'm still receiving pictures and emails about how amazing the Matchmaker Band was. They appealed to EVERYONE at my wedding -- the older folks loved the Motown jams and everyone hit the floor when Uptown Funk started playing. The "slower" music during dinner was so fantastic that couples started dancing before the plates were cleared. One of the singers brought me up on stage for one of my favorite songs, Proud Mary, and my husband and I were brought up again for the final song. We sang and danced our hearts out, along with our guests. Jerry was my primary contact leading up to the wedding and he was extremely responsive and professional. Every single member of the band is exceptionally talented and experts at engaging the audience. I'll never forget when Demetrius got on the dance floor and busted a move with my guests! The Matchmaker Band provided the soundtrack for a magical day that we will never forget. One note for future brides -- try to book a year in advance. Thank you to the entire Matchmaker Band for making us feel so special on our big day!" "Thank you so much for an incredible night! Everyone loved Matchmaker and Hunter And Kyle were so excited to have the dance floor packed for every song!! You guys are really the best!!! You made our night perfect and so much fun :):)"
"Awesome. Just awesome. Our wedding was basically the best party either of us had ever been to. So many guests said the same. Matchmaker was a huge reason the wedding was such a success and SO MUCH FUN! They are so much more than a cover band - they really love the music and put so much soul into it. I think everyone could FEEL this in the music. Dance floor was packed and nobody wanted to stop." "Your band is AMAZING and by far the best band I have ever seen at a wedding!! Our dance floor was the place to be and everyone had a blast!! We have received so many great compliments about you all! Thank you again for making our wedding SO fun and memorable!!" "PHENOMENAL!!! Thank you from the bottom of our hearts and the top of all of our guests favorite new bands list!!! :) you guys were exceptional - if I heard it once I heard it dozens of times last night... 'These guys are the BEST live band I've ever heard!" "We were just so happy with everything you did!!! The musicians and the singers just spectacular! Thank you for making the wedding a night to remember! Our best to you all." "Brides - STOP LOOKING - you have found your Perfect Entertainment! I'm not kidding - The Matchmakers Band is actual Perfection for your celebration! This band, this Amazing Live band blew everyone away! I had guests searching their website for their next local gig - 100% Groupie style! Each musician and vocalist is extremely professional, friendly, and committed to making YOUR DAY PERFECT. They MC'd my event flawlessly keeping the crowd entertained, laughing, and of course dancing! :). Can you imagine dancing to 'AT LAST' sung by a beautiful woman who could go toe to toe with Aretha? Or try to imagine swooning to 'Wonderful Tonight' and having to continuously look over your shoulder because you are sure Eric Clapton walked in to serenade you!! For those of you groaning - ok, your exaggerating - I'M NOT! Both event coordinators made a point to tell me in all the celebrations they have helped create... These guys are THE BEST LIVE BAND WE'VE EVER HEARD! Even better - each of the band members has their own awesomely chic style that will only help elevate the classiness of your day! This is a No Regrets, Beyond Worth It choice! If your budget doesn't allow for entertainment of this magnitude... Re-work the budget :) THEY ARE THAT GOOD! "We wanted to thank you so much for making our wedding so amazing! We had such a fun time on the dance floor and y'all made it a night we will never forget! We cannot tell you how many people have come up to us after the wedding saying that was the best time they have had at a wedding because of yall! Thank you so much for your enthusiasm and infectious energy and we will be sure to tell everyone we know about y’all!" "Everyone had the best night ever and is raving about Matchmaker Band! We hope to make it to a Motown Monday soon to relive the fun. :) Joey and I had the best night we could have imagined. Thanks again!" "Everyone is still raving about y'all and I'm pretty sure you will be getting some calls about future weddings and events. :) I will definitely be recommending you to ALL of my friends, though most of them were there. You guys were so amazing, and we couldn't be happier with how everything turned out. I've had several friends say, "it was the best wedding ever."" "You guys were AMAZING! Everyone complemented me on the band. Thank you for making our evening so much fun." "Tony and I are so appreciative of Matchmaker's enthusiasm for Tessie and Corey's wedding. Tony has booked a lot of bands in his day and he was extra impressed by the band's talent and enthusiasm." "Y'all were incredible. We couldn't have been happier with your amazing performance and the music in general. Also, many of our guests told us that they loved the band and have never danced that much at a wedding." "Sam and I are about to fly out on our honeymoon but I wanted to drop you a quick note saying how awesome you guys were on Friday night! Sam and I had so much fun and we've only heard amazing reviews from all our guests also!" Thank you and Matchmaker Band for a FABULOUS evening last Saturday night at our daughter's wedding! Of course, the band made the party such a blast and we had (and are still having) rave reviews about the entertainment. Thank you SO much for such a spectacular job, for the fantastic music, for the excellent NOLA sendoff--such a hit! We appreciate all of you so much! "We want to send a big THANK YOU to you and the whole band for making our reception the best party we've ever been to! We are both replaying the night in our heads over and over again, it was such a blast. All of our family and friends were on the dance floor, thanks to you. George and I both agreed that our band selection was one of the best decisions we made for the reception"
"Just wanted to send a big ol' thank you for the awesome talent of the Matchmakers band!! The event was super successful and your band even had the president dancing on the floor!! Our Events Manager was super excited about that because apparently it's never happened!! We all had a blast and really enjoyed the music/dancing. Every member of the band was fantastic in engaging the crowd. We truly appreciated the professionalism and again, the talent of Matchmaker Band :)"
"I have played in bars all over Indiana and Ohio for the last 25 years and I was blown away by the band. We ended us staying for 3 sets and I was very impressed to say the least. Keep up the good work." "Hi guys! I can't even begin to tell you what an incredible time we had at our wedding because of you! Matchmaker Band was BEYOND AMAZING. It's the #1 thing that people keep talking to me about... everyone wants to know who you guys are and what your story is. Every minute of the reception was a total blast. Thank you from the very bottom of my heart for putting on such an unbelievable performance." "Thank you so much for you and your bands incredible talent and performance for our wedding. You guys were great and helped make our special day, perfect … and everyone was wanting your information for future events." "WOW! WOW! WOW! WOW! WOW! WOW! WOW! Just a quick note from me to start your day with a big smile! Thanks to all of you and your teams for making our dream wedding just PERFECT!!!!" "Wow - you guys were wonderful! Having both young and old dancing together to happy, upbeat (but not too loud :) music is exactly what we wanted for our daughter's wedding and you guys did a marvelous job pulling it off. And you looked sharp doing it!"